The roads in Hyderabad betray the fast growth of the city – the few main roads that were ever asphalted are big construction works as flyovers are being built to carry the ever growing traffic through the city. The other roads were always overlooked and it feels it. The press of traffic is immense. And incredibly noisy, like being in Napoli. For the same reason too – everyone hoots their horns when overtaking. But here they also hoot to squeeze by in the jams, ward of others and, I suspect, as a vocal talisman to ward off ‘attacks’ by other vehicles. The best way to get around Hyderabad is by motorino (scooter). Most everyone has one – its almost like being in southern Italy. Using helmets is discretional. Ganesh has one, which, since I was passenger, left me enjoying the wind blowing through my hair – first time I’ve done that on a bike since I was 25. 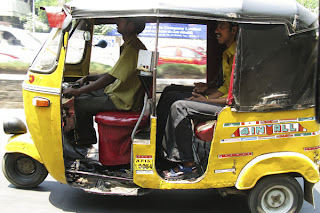 All I could think about was avoiding a crash… The second best way of getting around is by auto rickshaw – a motorized trike with the driver up front and the passengers sitting on a bench covered by a black vinyl hood. Thousands of them. Great way to go when doing some shopping. 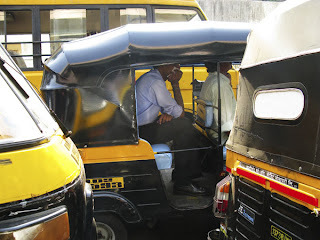 Then again, you can always drive, lacing your way between the motorini, rickshaws, taxis, cars, vans, trucks and buses. Best yet, get a professional driver to do it for you. As you all know, I’ve been to many places and I’ve driven in most of them. So I’m used to all styles, standards and systems of getting around by bike and car. There are some special places in the world where it’s a wonder how there are no pile-ups at every corner. Cairo, Casablanca and Cebu come to mind. Hyderabad takes the prize for being the most challenging. Not just because India, like many British ex-colonies, drives on the not-right side of the road. It’s the sheer oblivion that possesses a driver that stuns me. Nowhere else have I ever seen a more complete disregard for other people on the road. Other cars, trucks, vans, bikes and even pedestrians are apparently just don’t register. One night, riding on the motorino with Ganesh, just in front of us one guy decided to cross the front. The only problem was that there was another motorbiker in front of us too. Neither of them was aware of the other until it was almost too late. Did either of them react? Did the biker, not going particularly fast in any case, stop or swerve? Did the pedestrian run for his life? No, on both accounts. Result: one pedestrian found himself over the handlebars of the bike in the chest of the biker. The biker lost control and both went flying – hard. I think they made it, but for sure they were knocked out. Too many people came rushing from the sidewalks for Ganesh to feel it to be useful to stop. He was right. People just pull out of side roads in the middle of the main traffic. Others go the wrong way up a divided highway (one truck managed to skewer itself on the divider itself, stopping 20 meters in with its entire underside ripped out). Careful drivers like Ganesh find themselves overtaken on all sides – and crossways for good measure. And the bigger the vehicle, the more abrupt in just pulling out, changing lanes, stopping, whatever. I thought I’d seen everything till I came here. The showstopper was being driven by night. 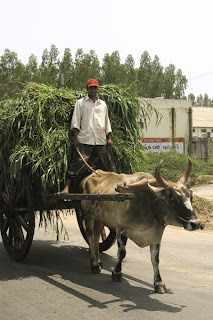 One day I went down to Machulipatnam, near the Gulf of Madras (see other blog). This was a long voyage down and an equally long voyage up to Hyderabad. The morning trip had all the ‘normal’ stuff. The night trip was a nightmare. Most vehicles are badly maintained (correction: erratically maintained). Which means no lights. Or worse, no guarantee of lights. Now put it all together. The oblivion of daytime driving - in the oblivion of the night. Terrifying. This part of India is booming, so the roads are full of trucks: mechanical matadors overtaking slower vehicles and challenging every oncomer. I had to close my eyes and simply seek my own oblivion by sleeping with half an eye on the traffic, fully expecting not to make it back. Thank goodness for the professional driver. Never, never, will I drive or be driven by night in India again. Never. Mumbai’s traffic felt positively civilized by compar-ison. Manic driving as always but done by ‘city folk’ so there is some logic in it at least. Hyderabad's traffic beggars description.